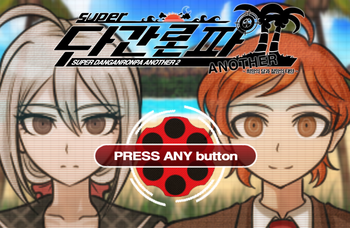 Super Danganronpa Another 2 ~ The Moon of Hope and Sun of Despair ~, more known as simply Super Danganronpa Another 2 or SDRA2, is an on-going fan game created by the Korean game developer LINUJ (린유즈). It is a sequel to his previous game Danganronpa Another ~ Another Despair Academy ~. The game currently has five playable chapters and a prologue. There are also two YouTube channels who are progressing the series along with LINUJ. The first is Johnny Youngster who is subbing the original version. The second is OfficialSDRA2 EngDub who is preparing an English dub for the game. And Now for Someone Completely Different: During chapter four, control shifts to Hashimoto just before the body discovery of that chapter. Control shifts back to Sora at the start of the second half of the trial. Animation Bump: The art style of the sprites along with the animation for the executions and trial cases are alot more smoother compared to the original. Hajime and Shinji become fast friends because of their dedication to health and fitness. Iroha seems to be this with Teruya when the two discuss their appreciation for rainbows. Chapter 2: Hajime lamenting his betrayal of the other students, only for the viewer to insult him in his new doll form. The scene ends with a pissed off Hajime cursing Mikado. Chapter 3: Emma, who is now a pile of flesh that Hajime describes as coming from a B movie, attempting to "catch up" with Hajime. The scene ends with her chasing Hajime while flirting/threatening to rip open his doll fabric and "reveal his true self." Chapter 4: Emma passing the time by endlessly telling puns, much to Hajime's frustration. Suddenly, the two get a call from Iroha asking for their advice since Mikado is demanding that she kill someone next. Despite receiving some enriching words from Hajime, the scene ends with Iroha blaming Emma for putting her in this situation and rudely hanging up. Chapter 5: Hajime and Emma try to pacify an angry Nikei, who is literally nothing but a left hand due to his right one being blown off. Although Nikei reveals that he viewed the members of Void as nothing more than his subordinates to order around, the two others are still completely willing to make amends with him. The scene, however, ends with Emma threatening to tell more puns and Hajime desperately begging for help from Nikei, who is still grossed out by the others' forms. Bloodier and Gorier: Both the murders and the executions in this fan game are quite brutal, with some of them being even more brutal than the deaths seen in the canon Danganronpa installments. Call-Back: There are a lot of similarities between this series and Super Danganronpa 2, its predecessor Danganronpa: Trigger Happy Havoc, and a bit of its successor New Danganronpa V3. Yuki meeting an unconscious Sora on a sunny beach, who has no memory of their talent or how they got there, is similar to how Nagito first met Hajime. The story also takes place in a deserted island similar to Jabberwock Island. Hibiki and Kanade's dynamic functions a lot like Hiyoko and Mikan respectively. Hibiki is presented as bratty, agitated and mean-spirited especially towards Kanade who is more submissive and apologizes for everything. This even extends to Chapter 3 where the bratty girl becomes a 'victim' to the submissive girl's dark side. A dinner party is held in the first chapter as a way to liven the spirits of the students. Later on, a concert showcasing the students with performance themed talents is held to boost the group's morale. One of the main locations that are visited is an Amusement Park. For the third murder case, the main killer had an accomplice who helped them carry out a murder, similar to Celestia and Hifumi. And in the fourth case, the Big Hearted Muscle character ends up being attacked by multiple people leading to them committing suicide to save their friends from execution, similar to Sakura from the first game. While the circumstances are different, the fourth chapters of both this game and its prequel DRA both had someone lose a hand due to trying to fire a jammed gun. Both the fourth chapter of this game and the second chapter of the prequel see a female character attempting to finish off the would-be victim to save another student. The only difference is that the latter was successful. There's also the big reveal that the killing game is taking place in a virtual world. While investigating an AV Room, Sora finds an old interview tape featuring a much older Yuri Kagarin. This is similar to how Hajime Hinata found a photograph of a much older Hiyoko Saionji during the last chapter. Just like with Kaito and Shuichi, Yoruko starts to avoid Sora after their falling out at the end of the fourth trial. And just like with the boys, they're able to talk out their issues during Chapter 5 and reconfirm their friendship. While discussing with Sora and Yoruko about the virtual world, Yuki worries that everything about their personalities, backstories and talents are all just fabricated for someone's entertainment. Yoruko comments that it sounds like a farfetched possibility. Cool Boat: The students live and sleep in a cruise ship when they're not exploring the island. Dying Clue: As Kokoro is trapped in a refrigerator to freeze to death, she uses some icicles to write out a message to the others about the identity of her killer. Everyone Is a Suspect: After the first trial, the students are unable to trust each other with the fact that any three of them could be members of Void and could kill them without hesitation. Evil vs. Evil: Instead of one, there are two masterminds involved in the killing game. The first involves the mastermind controlling Monocrow and the second is Mikado, the ringleader behind Void. Fanservice: In a rare instance for a Danganronpa series, there is a scene where Sora, Iroha, and Yoruko are locked in the bathhouse... while the boys are using it. Not to mention that Yuri walks right into the changing room after the girls have been kicked out. He's completely naked. Just like in V3, the Argument Armament battles involve stripping the opponents, both male and female, of their rebuttals and their clothing. Foregone Conclusion: Since this game is a sequel to DRA, the presence of Teruya Otori and Rei Mekaru gives away the fact that they survived the past Killing Game. Greek Chorus: The Void Theater segments sometimes have the deceased Void members discussing the events of the story. Halloween Episode: The 2nd Chapter can be considered this as it contains many Halloween related elements. Before the students arrive, Monocrow explains that the second island is notorious for its history of monsters and curses. There is a scene where Sora and the girls dress up as cute monsters and there is mention of a Curse of Yuki-Onna throughout the chapter. In Emma's execution, there is a shout out to the Cabin in the Woods where the actress is torn to pieces by various horror movie monsters. Hell Is That Noise: The pixellated alarm that goes off when Iroha is wrongfully voted as the killer. In Hibiki and Kanade's execution, there is a key that one of them can supposedly use to escape. Hibiki is eventually able to grab it and tries to use it to unlock the shackle around her neck. It instead triggers some sort of mechanism in the shackle that decapitates her. In Nikei's execution, he escapes the "press conference" through an emergency exit. He keeps running from a crew of Monocrow's chasing him, until he finds himself on a rooftop with a helicopter flying nearby. With no other way to go, he tries to jump to the helicopter. However, in the heat of the moment, he makes the mistake of trying to grab the ladder with the hand he had just lost a few moments ago, causing him to fall. A non-execution example occurs in chapter 4. After defecting from Void, Nikei reveals to the group that they're in a virtual world and that everyone who died has a high chance of turning up alive in the real world. After the fourth trial, he reveals that he was lying about the possibility of everyone being alive as a way of gaining their trust. Inverted Trope: The third chapter of this game inverts the usual formula of the Chapter 3 murders in Danganronpa games, by having one victim and two killers. Jidai Geki: The island featured in Chapter 2 has a traditional Japanese theme. Kill 'em All: In a last ditch effort to screw over Mikado, Nikei pulls out a gun and tries to kill his classmates. Before he can fire however, the gun explodes in his hand rending him harmless. In a first for literally ANY Danganronpa work, the students choose the wrong culprit in Chapter 5 and are subjected to a MASS EXECUTION. However, everyone seemingly gets saved at the last moment due to the simulator crashing. Minion with an F in Evil: Iroha is the least proactive and effective member of Void and has been called out for it by her peers. Mood Whiplash: In Chapter 2, Setsuka successfully convinces Hibiki, and by extension Kanade, to rejoin the main group. To celebrate, the twins give a live performance for everyone that livens their spirits. The mood takes a shift for the worse when they discover Kokoro lying on the floor unconscious. Mythology Gag: During Chapter 2's Climax Reasoning portion, there is a slide that features two wigs modeled after Makoto Naegi and Ibuki Mioda. Named After Somebody Famous: The main monuments featured in the islands are named after the Ultimate students from the prequel. In the first island, there's the Uehara Tower. In the second island, there's the Kurokawa Shrine. In the fifth island, the city is named Higa City. New Powers as the Plot Demands: During the Void Theater Segment of Chapter 4, Emma reveals that the living Void members are able to communicate with the deceased members via telephone. Hajime comments how they're just throwing in whatever they want. In the Chapter 5 segment, Emma shouts out some magic words which summons a pen and notepad to allow Nikei to communicate with them. Despite Hajime's confusion, Emma comments how it's better not to question these things. Pose of Supplication: Nikei does this in Chapter 4 after confessing to the group that he is part of Void and begs for their forgiveness. The Power of Friendship / Wrong Genre Savvy: In Chapter 2, Shinji explains to the group that he intends to be friends with everyone in hopes that those who are secretly Void members will join forces with them and turn against Mikado. Recurring Element: Several of the characters follow various Dangan Ronpa archetypes. Sora is introduced as an Ultimate ???. Yuri is a student who has a very low opinion towards men. Hibiki is an abrasive mean girl who turns out to have more insecurities then she leads on. Shinji is the Big Hearted Muscle of the group. Mikado is the designated 'Magical Weirdo'. Syobai is a boy with a talent that involves criminal activity. Kokoro is a stoic Emotionless Girl who is very helpful during the trials. Kanade is the killer of Chapter 3 who reveals a darker and more disturbing personality during the trial. Red Eyes, Take Warning: A common trait featured among the members of Void sans Mikado is that their eyes turn a bloody shade of red. Red Oni, Blue Oni: Yoruko is the emotional, temperamental red to her friend Sora's stoic, blunt blue. Sensitive Guy and Manly Man: Yuki and his friendship with Shinji. For starters, there are Crow Cards scattered around the island for Sora and the others to collect. For the concert held in Chapter 2, the twins perform one of their songs which is the opening theme for Suite Precure. Bonus points in that the girls are named after the leads of the show. After the concert, Nikei says the iconic "Well excuse me princess!" line to Yoruko. Soap Opera Disease: In Chapter 2, Kokoro falls victim to a mysterious but fatal illness that leaves her unable to speak or use the lower half of her body. Standard Evil Organization Squad: The terrorist group known as Void is featured in this killing game with Mikado as their leader. In Chapter 4, it turns out that Void was not always evil; it was originally created to search for someone important to the Void members and it only became evil once Mikado took over. Sudden Sequel Death Syndrome: Rei Mekaru, a survivor from the previous game, was burned without a trace by Mikado. Though according to Sora, she's actually still alive. Well, Excuse Me, Princess! : Nikei says this to Yoruko after the concert in Chapter 2. Wham Shot: At the very end of Chapter 5, after the simulation crashes and interrupts the mass execution, we get a shadowy shot of Tsurugi Kinjo as he decides to make his move. Wild Teen Party: The first chapter features the students engaging in a dinner party to raise their spirits. Unfortunately, someone brought in alcohol, which resulted in many of the students getting drunk. The first murder revolves around said party.